The most important thing you’ll need to pack is water. Even if the campground you’re going to has a source of water, you should pack your own. We keep a full water tank in our trailer at all times, even when just going on day trips or to shows since you never know if you’ll have a flat or an accident and get stuck on the side of the road. As for camping, we were grateful to have a full water tank when we were camping on opening weekend at Yosemite’s Bridalveil Creek Campground. The water lines hadn’t been used all winter and were full of rust. While the maintenance crew came in and flushed the lines for us the next day, we used our own water until then. You’ll need to bring all of your horse’s regular hay and feed. 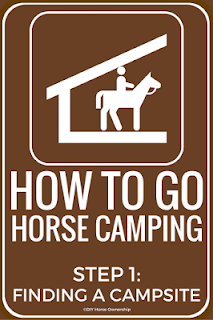 You’ll also want to pack some extra hay for the trailer ride. If you don’t have a hay rack on your trailer, you may want to invest in a hay bag to keep hay from getting all over your truck or trailer. Some campgrounds or parks will require certified weed-free hay. If your usual feed store doesn’t offer this, call the park’s rangers. They may know where you can stop on your way in to the park to pick up the required hay. I like to pack each day’s grain and supplements into individual tupperwares labeled with the horse’s name and day for feeding it. That way I don’t have to pack bags of grain and multiple jars of supplements. You’ll need hay nets and water and feed buckets for your horses. Often, even if a campground has water, there won’t be individual buckets or water troughs. And if the site does offer them, it’s safer from a potential illness standpoint to use your own buckets. 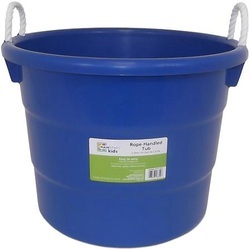 You can pick up cheap cooler buckets to act of water troughs. You may also want to invest in a hose to cut down on carrying water back and forth. We have a separate set of grooming supplies that live in the trailer. If you don’t, you’ll need to pack all your regular brushes, hoof picks, sponges, sweat scrapers, etc. Make sure you have fly spray and fly masks packed. If you boot your horse, pack your boots. 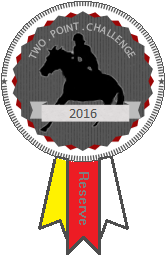 Even if your horse is shod, you may want to pack some spare hoof boots in case you lose a shoe. Even if you’re camping in the summer, it can be cold at some campgrounds, especially at high elevations. Last year it snowed in July in Yosemite. 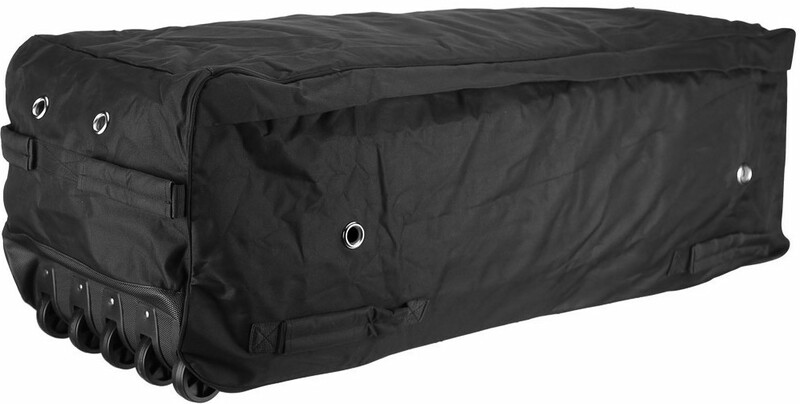 Your horse won’t have access to a stall or shelter if it rains so a rain sheet can be helpful even if it’s not cold. I like to put my blankets in travel vacuum bags. These can be flattened without a vacuum by rolling the air out. Then the blankets take up almost no room. If you have a dedicated living quarters, you can store stuff in cabinets and closets. If you’re tent or truck camping, get some large plastic bins. I don’t think I’ve yet been on a camping trip where I don’t get to the campground and inevitably realize I’ve forgotten something. To make sure the thing I’ve forgotten isn’t terrible important (not having graham crackers for s’more is okay, but not having propane for the camp stove would be bad) I’ve made lists that are taped to the bins the items go in. Since we don’t have an LQ with a fridge, we rely on coolers for all of our food and drinks. For short trips, we’ll shove everything in one cooler. For longer trips, we’ll use one cooler for drinks and one for food. We’ve managed 4 day trips with just coolers and ice without anything going bad. For longer trips, you could still manage without a fridge, you might just need to get some extra ice as the week goes on. Food is probably the best part of camping. To me camping is basically an excuse to eat all the good food. And who doesn’t love cooking over an open fire? 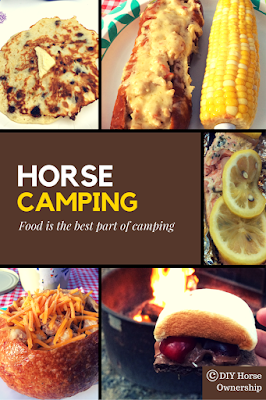 I have a post coming soon on my favorite camping recipes, so stay tuned for that. There’s no reason to exist on sandwiches and pre-packed food even if you don’t have an LQ or motorhome with a kitchen. Even without an LQ, you can live it up while horse camping. 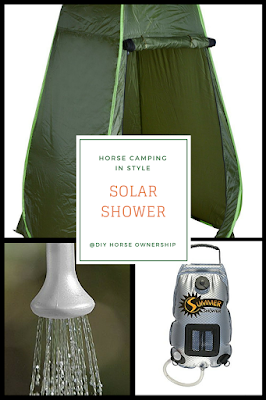 A solar shower will heat up sitting in the sun and be ready for you to take a nice, hot shower after your ride. Some people hang them in their trailers for privacy. I don’t like to get water in my trailer, so we hang ours from our EZ-Up and use a popup shower tent for privacy. Even if you’re camping in a tent, you can still stay warm when it’s cold or cool when it’s hot. We have a Little Buddy propane heater for staying warm and a Coleman tent fan for staying cool. The coleman fan runs on a battery that can be subbed in and out of your Coleman lanterns. And the batteries come with a car charger so you can top them up if you need to even if you’re staying at a primitive campground. The propane heater doesn’t require any electricity, just an extra propane tank. Finally, even if you don’t have an LQ, you can still be entertained. 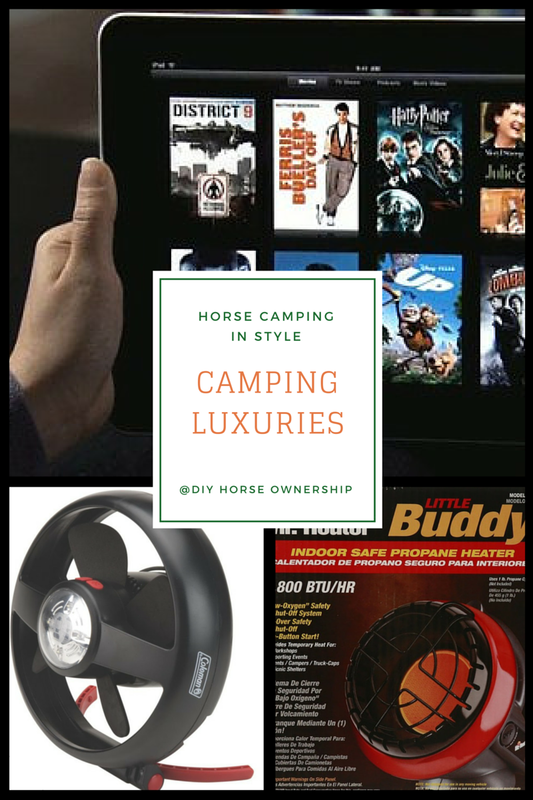 We like to take an iPad with us while camping and watch movies that we downloaded in advance. Wow I am bookmarking this! I have never gone horse camping but it has always been a dream of mine. What do you use to store your water in? That does like something that would be handy to have even when going to shows to bring your own water that the horses are likely to drink (and for emergencies). You're idea of taping the lists to the storage containers is BRILLIANT! I have a bunch of lists saved on my computer I print out. They're all different based on where I'm going and what I'm doing…But they are lists of EVERYTHING I want to pack. Smaller lists on the containers seem much more efficient. Thank you for this great idea. I LOVE this series! Wow! You are so organized! I've never camped with my horse, but maybe this year. But we do camp a lot as a family, the lists taped to the tubs are brilliant! We have a water tank installed in the horse trailer. We also have a 7 gallon Aqua-Tainer for our own water. It really helps us cut down on thinking we have something in another container and not. This way we check off against each container. This organization is a facade. We have to make these lists because we're otherwise so disorganized we would always be missing something.